What are your best tips, tricks or formulas for Lightroom's Smart Collections? I use a few Smart Collections in Lightroom to automatically let me see things like all of my finished HDR images, sets of images uploaded to SmugMug or Flickr, and the like, but I'm curious what other ways folks are using Lightroom's Smart Collections. Share your best Smart Collections tips/tricks/formulas. As you can see, I rely on file naming and keywords for information that is not directly available in Lightroom. For example, since the aspect ratio is not a filter, I have to either put "pano" in my panorama filename or add the "panorama" keyword so that I can create a smart collection later on. My best tip for using Smart Collections is to learn the use of the 'Alt' or 'Opt' key when setting criteria. Holding down the Alt/Opt key when adding criteria changes the 'AND' function to an 'OR' function. For example, you could create a Smart Collection where the criteria are 3 stars or better AND a Blue OR Green label. Collections and Smart Collections are probably one of Lightrooms most powerful library features. My tactic with Lightroom is to import all of my photos into a single folder, and use the Lightroom catalog to tag them with keywords and metadata, and find them via Smart Collections and searches. A smart collection really is just a saved search. You specify the criteria you want to search by, and save the smart collection. You can quickly find any photograph that meets those criteria at any time simply by clicking on the collection. Even farther, you can nest smart collections in collection sets. This allows you to quickly find broader or narrower sets of photos in your entire library with a single click. I have only begun to really use smart collections. My primary criteria is by keywords, as that is the easiest to filter on. You can use "fuzzy" keyword sets, by adding a single keyword rule, and separating the list of keywords by commas. This will include any photograph that has any one of those keywords. If you want an exclusive match, you can add a keyword rule more than once, with a single keyword in each. A blend of the two is possible by using multiple keyword rules that have comma-delimited lists of keywords. I recently explored them in quite a bit of detail, and they are far more powerful than just searching by keyword. You can use rating, flags, color tags, any IPTC or EXIF metadata, any camera or lens information, location data, and much, much more to build searches with. I have about 10,000 photos, so my library is big but not huge. So far, smart collections that just use keywords has been sufficient. 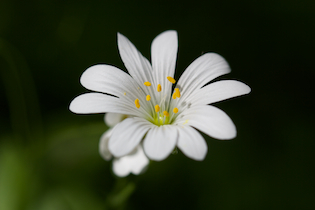 I have recently started rating all of my photos, so I may add or modify my smart collections to include ratings (i.e. Rivers (All) and Rivers (Best), where the 'Best' collection is 4 or 5 starred.) The possibilities are nearly endless with smart collections. The key to them is realizing that they are really saved, dynamic searches that can utilize any criteria to find any photo in your entire library almost instantly. My most recent use of Smart Collections has been to help with cataloging and backing things up. I wanted an easy way to place all my images using the Publish tool into my backup/storage solution, however that would easily overflow the collection size. I decided to create Smart Collections for each month since January 2000. This task might sound a little rough, but once the process was defined I quickly wrote a script to create the 132 rules. Now when I am looking for something I can easily find it by honing in on the date. Yes, I could use the built in time tools in Lightroom, however that would not work for creating logical storage groups the way that using the Smart Collections would, since the Smart Collection works both in the library itself and in the publish section. It also means that my storage location is organized by year and month making it very easy to find what I am looking for when I am not using Lightroom, since my storage is in the cloud itself. Not the answer you're looking for? Browse other questions tagged lightroom smart-collections or ask your own question. Does the number of smart collections affect Lightroom's performance? In LR smart-collections, what is the difference between 'contains', 'contains all' and 'contains the words'? How to create smart collections in Lightroom for hierarchical keywords? Creating “Smart Folders” on the hard drive based on photo IPTC metadata? 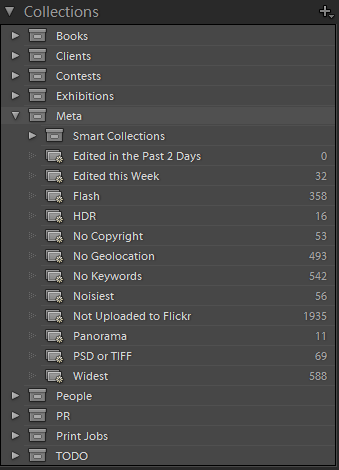 Does Lightroom 5 allow nested conditions for smart collections?